All spiders are predators. They feed on a wide variety of insects and other soft-bodied invertebrate animals. Spiders attack and subdue their prey by biting with their fangs to inject a poison. All spiders spin silk, but the silk is used in a wide variety of ways. Most spiders construct a silken case to protect their eggs, but not all spiders make a web. A few use silk threads much like a parachute to aid in dispersal on wind currents. 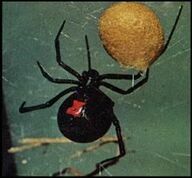 The most dangerous spiders to humans in North America are the Black Widow spiders and the Brown Recluse spiders. They are usually associated with dry, undisturbed piles of firewood, old lumber, dry crawl spaces, outbuildings, rock piles, or bales of hay. Black widows are shy, retiring spiders and bite only reluctantly, usually only when molested. Widows are more aggressive when they are protecting an egg sac. The bite of the widow spider causes little immediate pain and may go unnoticed. Slight local swelling and reddening at the bite site are early signs, followed by intense muscular pain, rigidity of the abdomen and legs, difficulty in breathing, and nausea. The brown recluse spider is common in the southern states. The bite of the brown recluse spider either may go unnoticed with no aftereffects or may be followed by a severe localized reaction characterized by scabbing, sloughing off of affected tissue (tissue necrosis), and very slow healing. BLUE STAR takes a systematic approach when performing an exterior spider control service to control web producing spiders. As with mosquitoes, spiders will not be completely eliminated due to their mode of movement and habits, but our service will provide a suppression of the spiders entering the structure. A complete inspection of the exterior of the structure to identify spider harborage areas. The removal of all spider webs on the exterior 1st floor of the structure. An application of a non-pesticide treatment on the structure in the hot spots where spiders harbor to prevent webbing activity. A 10' barrier of insecticide around the foundation of the structure. The Exterior Spider Service for web producing spiders is guaranteed for thirty days and works best in conjunction with our Pest Control Maintenance Agreement as this protects you against 22 different pests thereby eliminating the spiders' food source.